Recorre los lugares de rodaje de programas de televisión como Gilligan's Island, Hawaii Five-0 y Magnum PI. Visita playas, tiendas, miradores y restaurantes. Incluye entradas, y aperitivos y bebidas. Diríjase al banyan tree de Kuhio Beach en la playa de Waikiki para encontrarse con su guía por la mañana. Su guía lo equipará con su bicicleta y casco, y luego lo llevará más allá de la playa de Waikiki, el zoológico de Honolulu, los canales Ala Wai, el paseo marítimo, el Centro de Convenciones de Honolulu, la Isla Mágica, Point Panic y el Parque Kaka’ako. Echa un vistazo al arte callejero del distrito de Kaka’ako y sube en el ascensor hasta la Torre Aloha para admirar las vistas panorámicas de Honolulu. Continúe su viaje por Chinatown y el centro de la ciudad, y deténgase para probar algunas de las frutas exóticas de Hawaii. Pasee por el histórico Capitolio del Estado, el Palacio Real de Iolani, la estatua del Rey Kamehameha, la iglesia de Kawaiaha’o, el Museo de la Casa de la Misión y el lugar donde se celebró el famoso concierto "Aloha From Hawaii" de Elvis Presley en 1973. El terreno es en su mayoría plano, y usted se detendrá regularmente para tomar fotografías y parar a descansar. Echa un vistazo a las playas, parques, clubes canoa hawaianos y tiendas en el camino, y aprende dónde puedes encontrar excelentes lugares para comer, playas y otros favoritos locales. This was my favorite activity we did in Honolulu! This was so much fun and the tour Guide Kelly emails you all the picture from the day so you don't have to stumble with your camera while on your bike. It was excellent! Highly recommended. A bike tour as a great way to see a new city. We had a small group of adults, an informative guide and we covered a lot of territory that we wouldn't have seen on our own. Kelly included old history Iolani Palace for example and recent history Obama's school. He included things you expect to see statue of Elvis and things you don't a Chinese market and mural art. We started and stopped in a tourist area, but certainly saw non-tourist parts as well. He also pointed out great places to eat Uncle Bo's, which was excellent and busy. We may have received deeper old history knowledge on a different tour, but Kelly is an interesting and engaging guide. We also appreciated the water and snacks, all the pictures he shared, and being up close to local events that were taking place that particular day. Fun memories! First morning in Honolulu we scheduled this tour. Our tour guide Kelly took us on a four hour adventure to parts of the local venues we would not have otherwise seen or found on our own. 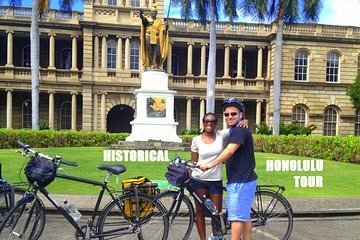 Treat yourself and take a bike ride around Honolulu with Kelly. Fun! Local guide with good knowledge. Highly recommend seeing Honolulu by bike. Interesting locations in non-touristy places. Easy ride even for beginners. Avoids parking hassles too! This was the perfect way to see Honolulu and learn so much about the history. Kelly was a great guide who went out of his way to take photographs of us, send a movie of our experience, treat us to local food and just show us the best highlights. A wonderful experience from a guide who was enthusiastic, funny and knowledgeable. One of our favourite highlights of visiting Oahu was this trip. We really enjoyed our tour with Kelly. He is a wonderful friendly guy and made us feel very welcome. We saw so much more by riding around Honolulu on the bicycles. We could not have achieved this by ourselves. Good value for the money. We fortuitously found Kelly's tour via a Lonely Planet link to Viator. We were picked up in front of our hotel on time and transported to the meeting place in Waikiki Beach. Kelly was ready for us with well maintained bikes complete with water, Gatorade, and a few snacks. Kelly was most knowledgeable and very enthusiastic and kept us informed of both the history and contemporary issues of the sites we saw around Honolulu. He led a great tour which turned out to be our own private one and was patient and kind all along the way. He took a lot of great photos of us and the tour was both safe and interesting the entire time. He had great recommendations of things to do after our tour and places to eat and shop. While we had a few drizzles toward the end of the tour, they did not dampen our experience. I don't think Kelly could lead a bad tour! HIGHLY RECOMMENDED YOU TOUR WITH KELLY.